Jobbik held a meeting with Hungarian intellectuals in Budapest on Saturday night. 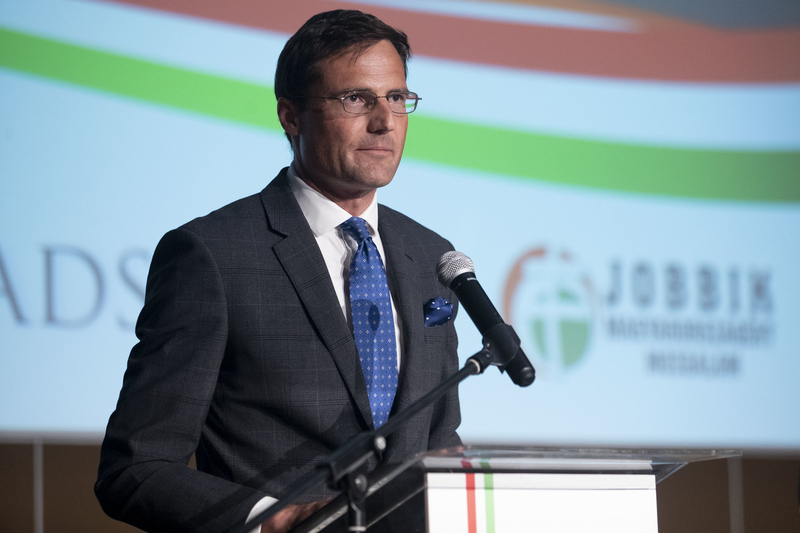 Jobbik’s president Tamás Sneider talked about the increasing servitude experienced by Hungary’s society and identified Jobbik’s mission: to make an alliance for freedom and the elimination of servitude. Executive vice president Márton Gyöngyösi presented an analysis of the EU’s status in connection with the various federalist and nation-state utopias, and called for an alliance against the Orbán regime. “Can you ever make a compromise with the Orbán regime?” he asked the watershed question. As Jobbik’s president, he expressed his view that no such compromise can take place as long as most opposition parties are filled with “bought and controlled” people. Listing the arguments against a compromise, he mentioned the disastrous demographic situation first. According to his calculations, the population decline, emigration and the ethnic conditions have caused Hungary’s society to have lost 1 million people in the Carpathian Basin during the past 8 years, which even exceeds the 700-thousand loss of the eight years under the Socialist government. As another argument, he noted the economic situation with special regard to the predicament of the SME sector, multinational companies gaining ground and Hungary’s dependence on foreign assembly plants operating in the automotive industry, for example. Finally, he mentioned the country’s moral status as another argument against any compromise. As he put it, “half of the country accepts corruption”, “Hungary’s society has been pushed into servilism” and “there is no chance for any change” as long as it stays that way. Then he identified Jobbik’s mission: to fight against servitude and servilism, and eliminate fear from the society. Noting that it would be a fierce struggle, he warned that the regime had no intention to soften up. Mr Sneider believes that PM Orbán is preparing for the government change himself but the PM’s goal is to keep the opposition in a weak and divided state so that even if the opposition wins, either Mr Orbán or his successor could return to power the same way it happened to the first democratic government elected after the collapse of Communism (which the PM could study very well). In Mr Sneider’s view, this is Mr Orbán’s latest agenda, which can only be prevented by Jobbik. However, it is going to be difficult because Mr Orbán has also got his family “involved”, so he now has to fear for them and not just himself ending up in prison, which just makes him even more dangerous. The next speaker was Jobbik’s executive vice president Márton Gyöngyösi who, before discussing the situation of the EU in light of the upcoming EP elections, briefly commented on a “new phenomenon”, the “opposition-replacing mood” advocated by certain intellectuals critical of the government. He said it was incomprehensible why such people as left-wing journalist Gáspár Miklós Tamás, former state secretary György Raskó or historian Krisztián Ungváry would promote the idea of opposition parties basically dissolving themselves and why they thought it would “make the West snap to attention at last”. 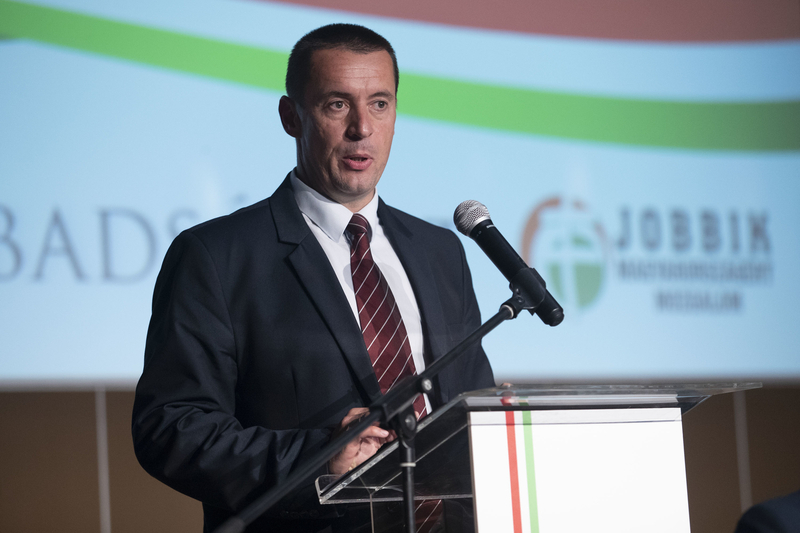 As 1.3 million people entrusted Jobbik with their votes, Mr Gyöngyösi believes it is the party’s duty to continue fighting without giving up and do their best in a parliamentary framework. So he suggested these intellectuals instead to “show an example” and stop publishing articles, “go to work in a steel factory”, perhaps that would “make the West snap to attention at last”. Talking about the election results, he said “Bolshevism prevailed” over the opposition political parties as well as the NGOs, the churches, scientists and intellectuals. “It is a strange twist of fate” that Mr Orbán, who founded the civic circles in 2002 to fight Bolshevism, is now the one to promote it. In Mr Gyöngyösi’s view, all people who want a liveable, normal and civic Hungary should ally against the Orbán regime, a.k.a. The System of National Cooperation. This is necessary “in order to restore democratic values” and any disputes “that the political sphere must conduct in any normal country” should only be conducted afterwards. “That’s why Jobbik has been building bridges for years and that’s what induced the people’s party policy as well,” he added. “While we are busy discussing if the EU should be a federalist unit or the Europe of nations, we fail to realize that there’s no common European identity to support federalization,” he said, noting that the foundation of any common identity should be the insistence upon Christian values. He concluded that federalization was “total naiveté, total utopia”. On the other hand, he also criticized member states proudly defining themselves as nation states and “refreshingly homogeneous”, and asked if these countries could truly consider themselves as strong, sovereign states when they lose hundreds of thousands of their youth within a few years, are depressed by a demographic disaster, and “their economies are built on EU cohesion funds and they need to rely on foreign investment”, Jobbik’s executive vice president pointed out. Mr Gyöngyösi believes these issues should be discussed before the beginning of the EP elections next April. This would allow the election campaign to address such matters as the situation of the national state, autonomy, wage equality or migration. “One of the most important questions will be if we can conduct a social debate where we can address and promote the key issues of our own national state as well as those of European values and European spirit in general,” he concluded his speech.